Students currently enrolled in the Fitness and Health Promotion Diploma at George Brown College may be considered eligible for admission. Graduates from the Fitness and Health Promotion Diploma at George Brown College with a minimum grade point average of 3.0 (B or 70%) and who have met any additional program or degree specific admission requirements, will be granted a block of 45 credits when entering the BA or BSc Honours in Kinesiology in the Faculty of Health or any other undergraduate Faculty at York University. Advising specific to the additional BSc requirements will be provided upon admission. Students applying to the Kinesiology program will be considered to have met the Biology admission requirement. Depending on the electives chosen in the Fitness and Health Promotion Diploma at George Brown College and the desired program at York University, a student may need to complete more than the minimum of 75 credits toward a total of 120 credits required to graduate from York University. 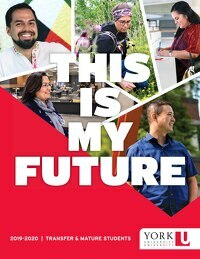 For details about admission requirements, including prerequisites (if applicable), visit futurestudents.yorku.ca/requirements/cmu. Students who have graduated in the past three years from the Community Worker diploma program at George Brown College with a minimum grade point average of 3.0 (B or 70%) and have met any additional program or degree specific admission requirements may be considered for admission to enroll in the BA in Race, Ethnicity and Indigeneity program or Human Rights & Equity Studies program, or any BA program at York and granted a total block of 36 transfer credits. Therefore, transferring students will be required to complete a minimum of 84 credits to meet the degree requirements for the Honours BA. Depending on course waivers and the degree program chosen, students may need to complete more than 120 credits to graduate.